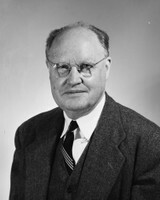 James Penrose Harland (1891-1973), professor of archaeology, received his BA (1913), MA, and PhD from Princeton, the last after a delay caused by his service in the Navy during World War I. He also attended the University of Bonn (1913-14) and taught at the University of Michigan and the University of Cincinnati before joining the faculty at North Carolina in 1922 as an Assistant Professor of Classics, the first full-time archaeologist at the University. Promoted to associate professor of archaeology in 1927 and to professor of archaeology in 1929, he continued to teach large and highly popular undergraduate courses until his retirement in 1963. Harland sometimes taught a thousand students in a year, and even after his retirement he continued teaching in the Evening College until 1968. As a field archaeologist, Harland spent a total of four years between 1914 and 1927 at the American School of Classical Studies at Athens, the last (1926-27) as a Guggenheim Fellow. He also was a Kenan Fellow in 1939. He participated in excavations at Nemea, Zygouries (in 1921, under Carl Blegen), Corinth, and Mycenae. He is author of The Peloponnesos in the Bronze Age (Cambridge MA 1923, a separatum from Harvard Studies in Classical Philology 34, 1923) and Prehistoric Aigina. A History of the Island in the Bronze Age (Paris 1925, his PhD dissertation, republished by L’Erma di Bretschneider in 1966), and several articles. His papers, 1906-1969, preserved in the Princeton Library’s Department of Rare Books and Special Collections, include an extensive diary, beginning when he was 15 years old and continuing until some years before his death in 1973. Harland wrote Carmichael a steady stream of notes about university affairs, often posing as one “Jno. Ponsonby Hootle” of the firm Hunkerdunker, Hunkerdunker, and Hootle. Several dozen of his letters are preserved in the Records of the Office of the Dean of Women (Collection # 40215, Southern Historical Collection, Wilson Library). We give here the transcript of one such letter, as an example of Harland’s wit; he clearly enjoyed both pure silliness and pointed satire. The original is written out in longhand. At the last meeting of the Board of Trustees of the Consolidated University of North Carolina, a report was given on Student Affairs, which grieved us all. And I may add—which still grieves us. On Saturday night, March 7th, 1964, a dance was given for men living in dormitories, and for their “dates” (that is, young ladies who have been invited by dormitory men, respectively—and respectably). It was hoped by all present at the dance—in the Ball Room of the Carolina Inn—that the dance would be honored by the presence of the Dean of Women. But you, one of the B.F.B-s—“Best Families of Birmingham”—preferred to attend a higher social function, namely a sorority Dance. Don’t they teach Democracy at Carolina? What would Thomas Jefferson have thought of your action? Or Patrick Henry? Or those who gave their lives at Antietam? Are coronets greater than Norman blood? What price democracy? What price Birmingham Steel Preferred? Your socialiting distresses us, yea, grieves us. Gifts in the name of Professor Harland have been made to the university by his former students continuously since 1973. The James Penrose Harland Endowment Fund in Classical Archaeology was established by one of those students, who remembers fondly and gratefully his introduction to ancient art by Professor Harland. This Fund has been used principally to help graduate students participate in archaeological fieldwork, specifically to offset expenses associated with travel to Greece, Italy, Turkey, and throughout the Mediterranean world. Fieldwork is a vital part of training in classical archaeology, and The J.P. Harland Endowment Fund makes possible hands-on experience for UNC students, allowing them to work shoulder-to-shoulder with archaeology faculty, learning excavation and recording techniques firsthand. Professor Harland, who was both a dedicated teacher and a pioneering excavator and researcher, would have appreciated greatly a fund in his name supporting student fieldwork.